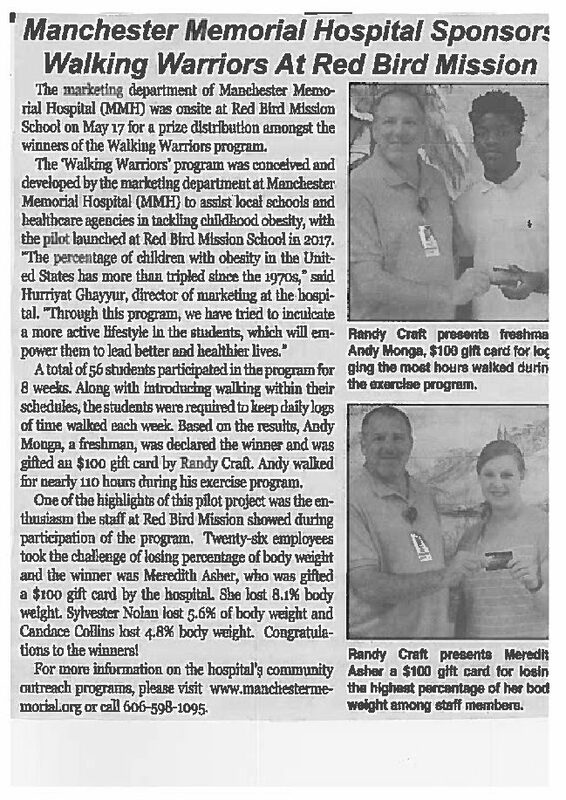 5/25/2017 (Manchester, Kentucky) – The marketing department of Manchester Memorial Hospital (MMH) was onsite at Red Bird Mission School on 25th May for a prize distribution ceremony among the winners of the Walking Warriors program. A total of 54 students participated in the program, for 8 weeks. Along with introducing walking within their schedules, the students were required to keep daily logs and come in for a preliminary weigh in and a post-challenge weigh in. Based on the results, Betty Joseph, a freshman, was declared the winner and was gifted an iPad by Hurriyat Ghayyur. Betty walked for nearly 3100 minutes (51.6 hours) during her exercise program. On being asked what the most challenging part of the 8 weeks was, she responded with “balancing my studies, sports and other activities with walking time”. One of the highlights of this pilot project was the enthusiasm the staff at Red Bird Mission showed in order to participate in the program. As soon as this was opened up to them, a total of 12 staff participated in the challenge. “Though this was open for the staff for only 4 weeks, we’ve seen that walkers in the program lost some weight, reduced blood pressure and made positive changes in their diet”, said Ghayyur. The employee with the most walking time was Betty Mosley, who was gifted a FitBit by the hospital. Betty reported that apart from losing some weight, she also lost 2 inches off her waist and is sleeping better than before. Ashley Collett and Sylvester Nolan came in second and third respectively. Going by the positive feedback received, MMH along with the Red Bird Mission’s community outreach team, plans on continuing this program. “We are thrilled by the enthusiasm and feedback, and would like to offer another challenge in September this year, as walking remains the simplest and least expensive physical activities that has a direct, positive impact on a person’s health,” said Ghayyur.